David MacLennan and I at the 250 celebrations of a Play, Pie Pint! A fabulous night on Saturday at Oran Mor. The Polystyrene Pie awards, celebrating 250 new plays. 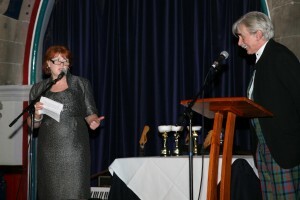 I presented Julia Cadzow with an award for the best supporting act, i.e. in her role as spurned partner putting up with David and his mistress , The Play, Pie and a pint.